I've talked about this book before, but I think it's worth talking about again. It's called Shoujo Manga Techniques - Writing the Story. It details out, in explicit detail, as a writer, how to write a story. It's done in comic form, so if you like mangas, it's definitely worth checking out. Chapter one begins with teaching (in a very entertaining way!) the 5W1H Rule. We know it as "Who, What, Where, Why, When, and How." They refer to these as "scenes," and teach you how to compile scenes into an entire story. (This is the most simplistic of their writing techniques.) They also give a nice little sentence about the questions you're answering, which I will share with you. Who: Explain who your main character is. When: When is the story happening? Morning, afternoon, night? Today, yesterday, a year ago? Where: Where is the story taking place? Beside a building, inside a coffee shop, in a real world or a made up one? Do What: What do the characters (main characters) do in the story. Why: Why are the characters (main characters) doing this? How did it go: Explain what happened due to the character's (main character's) actions. I was thinking about this earlier today, and all the LJ communities out there for writing prompts. I've always loved pictures, especially of houses, gates, nature, etc., because those types of things inspire me. So I decided to write and share a scene with all of you! Who: A boy in love. When: Early in the morning before school. Where: On the girl's front porch. Do What: Wrote her a note so she would see it when she went for a morning run. Why: Because he wants to see her. How Did It Go: She brought it inside and cried. She opened her front door, letting the cool, brisk morning air wash over her, soothing her swollen eyes. She couldn't remember the last time she had cried so much. She had even fallen asleep with the tissue box in her arms, clinging to it instead of her favorite stuffed teddy bear. She closed the door behind her, her sneaker colliding against something that went skidding along the porch. Startled, she looked down, following the trail from her foot to an object now-lying near the top of the stair, teetering precariously on the edge. Her heart raced in her chest as she saw the dark blue notebook he always carried around with him, darting a quick look around to see if he was nearby, watching her. Seeing no one, she slowly crossed the few steps, kneeling down to retrieve the book. She gently pulled open the cover, cold from the hours outside, and flipped through all of the sketches he had so skillfully drawn on the white pages. But why had he left her this? Why, after she had so stupidly opened her mouth and told him exactly what he didn't want to hear, did he leave her his most prized possession? Her breath caught in her throat as the careful sketches turned into big blocked letters, inked in his familiar handwriting. 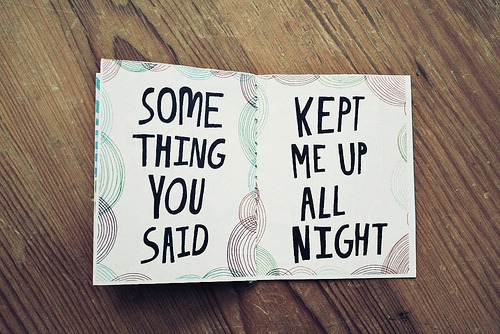 Something you said, it said on one page, kept me up all night, it said on the other. She felt tears well up in her eyes, looking around once more for him. But she was alone in the early morning hours, the street deserted except for the birds overheard and the neighbor's cat running along the grass. She slowly turned the page, her tears sliding down her cheeks as she read the next sentence. But I still love you. She rushed back into the house, clutching the notebook to her. She ran up the stairs to her bedroom, hugging the notebook against her chest as she threw herself onto her bed. Now, I have no idea where I would take this... I probably wouldn't even really write it that way if I were writing a full story. But if I was going to, and I was struck with writer's block, I'd just go get a new picture and start all over again. P.S. Store these ideas ("scenes") in your idea journal! You'll thank me later!